Sending “picture postcards” when traveling was once the standard way of sharing your travel experiences with the folks back home. The internet and social media have almost made the practice obsolete. But, it is still just as exciting to receive a postcard form a friend or loved one from a far-flung destination. 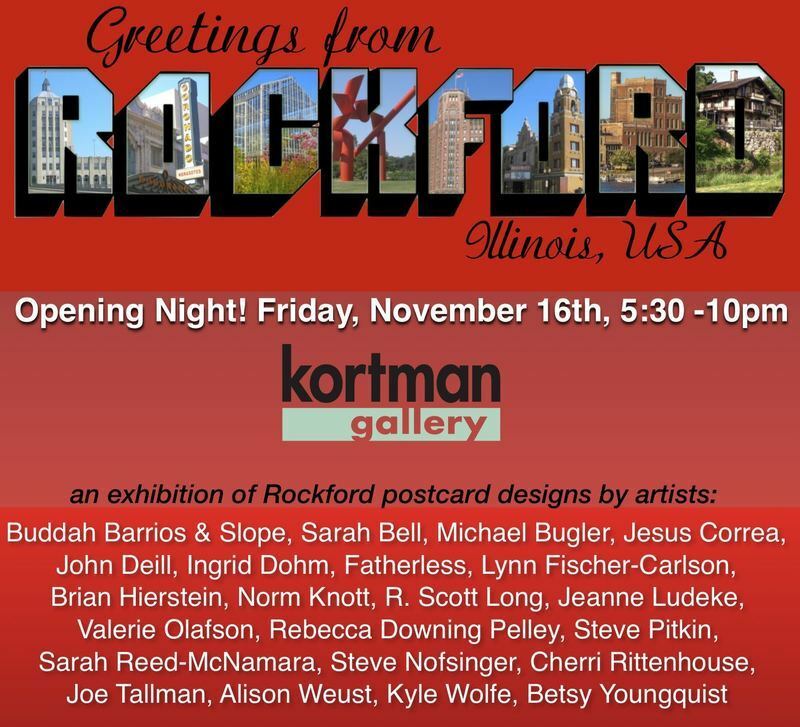 This holiday group exhibition featuring Rockford postcard art opens Friday, November 16th, 5:30 to 10pm. “We created some postcards of our own to fill the need, however, we thought it would be great for artists who make Rockford their home, to create images that not only represent their view of the city, but also celebrate Rockford’s vibrant, bourgeoning local art community,” says Jerry Kortman. Patrons will not only be able to purchase the original art works, but also the postcards which can be addressed, stamped and mailed right from the Kortman Gallery. “Greetings form Rockford, Illinois USA” opening reception is Friday, November 16th from 5:30 to 10pm and on display through January 5th, 2019. The Kortman Gallery is located upstairs at J. R. Kortman Center for Design, 107 North Main Street in Downtown Rockford. For more information call 815-968-0123 or visit www.jrkortman.com.